What does Moscow expect from new U.S. Secretary of State Rex Tillerson? Russia's Prime Minister Vladimir Putin and ExxonMobil President and Chief Executive Officer Rex Tillerson attended the ceremony of signing of the Rosneft-ExxonMobil strategic partnership agreement, 2011. U.S. President-elect Donald Trump has selected ExxonMobil chief Rex Tillerson as a key member of his team. "Pragmatic," "professional" and a "friend" of Vladimir Putin – the announcement of his appointment comes as potentially good news to Russia. Donald Trump has chosen the next U.S. Secretary of State – 64-year-old ExxonMobil chief Rex Tillerson. "I have chosen one of the truly great business leaders of the world, Rex Tillerson," tweeted Trump, adding that Tillerson is the best candidate because “he has vast experience at dealing successfully with all types of foreign governments." The chairman and CEO of America's largest oil company is familiar with many influential circles in many countries. He has been in senior management for a long time, including in affairs linked to Russia, and is known to be a strong opponent of sanctions against Russia. The Western media presents him as "Putin's friend," a man with close ties to many politicians and businessmen in Russia. 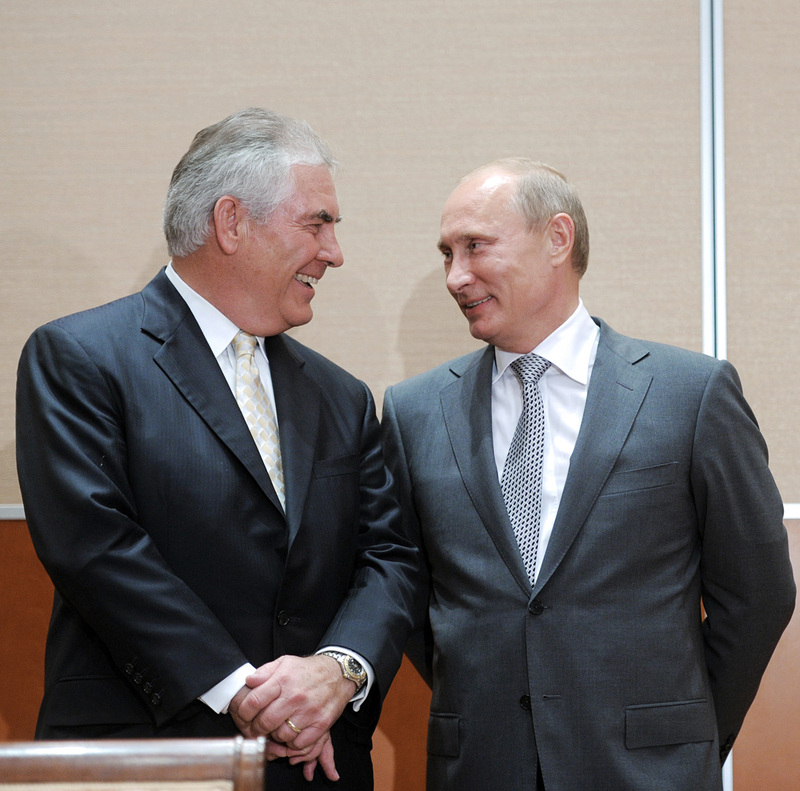 And it is certainly true that Tillerson has been awarded by Putin with the Russian Order of Friendship (for improving relations between the two countries) and that collaborates with Rosneft so closely that ExxonMobil even planned to invest in Russian deposits. In 2011 the American corporation signed an agreement with Rosneft on joint oil production in the Arctic and Siberia, which was then halted due to the sanctions. However, relations between Putin and Tillerson are not as close as they seem, according to Trump aide Kellyanne Conway: "It's not like Vladimir Putin and Rex Tillerson 'down vodka shots' at the local bar," she recently said. Yet Russian observers believe the new key member of Trump's team is capable of making significant corrections to bilateral relations with Moscow. "Pragmatism" is perhaps Tillerson's principal quality and it is this quality that, when considering his appointment, Russia remembers most. "We believe that this pragmatism will be a good basis for constructing mutually beneficial relations, mutually beneficial from the point of view of Russian-American interactivity and of solving international problems," said Russian Foreign Minister Sergei Lavrov, adding that President-elect Trump is also pragmatic. The Kremlin, in turn, underlines that business is one thing and diplomacy is another, and that "there is a big difference between the two." "Whatever the sympathies are, they are certainly put aside (if one is a secretary of state), and what is left is the readiness to demonstrate a constructive frame of mind and act professionally," said presidential press secretary Dmitry Peskov. But with all its attractiveness for the Kremlin, in Moscow Tillerson's sharp criticism of the Western sanctions against Russia is believed to be linked to his business interests. "His company is one of the few American companies that actually suffered as a result of the sanctions against Russia – it either incurred certain losses or it missed out on an opportunity," explained Yury Rogulev, director of the Franklin Roosevelt U.S. Studies Foundation and head of the Laboratory of Modern and Contemporary European and American History at Moscow State University. Nevertheless, Moscow has high expectations for the businessman. Tillerson is a corporate diplomat who has enormous experience in international business and an excellent track record, and "it is unlikely that he would have remained in his post, in one of the world's largest companies, if he was incompetent," said Sergei Karaganov, dean of the Department of World Economy and Politics at the Higher School of Economics in Moscow. The bottom line is that Moscow will at least know whom it is dealing with, said Karaganov: "Tillerson and all of Trump's foreign policy and security appointees are a) different from the previous politicians and b) not ideologized like the previous ones." Rex Tillerson still has to be confirmed by the Senate and this process is rather worrisome. Before Trump made the final decision, rumors of Tillerson's appointment were called nothing but "provocative" because "Putin's friends" are not popular in Congress, especially among the Democrats. "We see that Trump is continuing his so-called 'draining the Washington swamp' policies and has appointed a man who is far from Washington," said Rogulev, adding that obviously, not everyone likes this. If the appointment goes through, the U.S. will have a key politician with a clear conflict of interests and the senators will press this issue. A policy of softening sanctions against Russia or lifting them completely is capable of significantly raising the price of ExxonMobil shares. But since the Republicans have 52 chairs in the Senate against the Democrats' 48, Tillerson's candidature will likely be confirmed. He has already begun the process of leaving the corporation and the sanctions issue will surely not be the first step towards improving relations. "Besides Russian-American relations he will have a huge number of problems and questions and I don't think he'll do this in a hurry, unilaterally, without consulting Europe. But with Tillerson, Russia can count on U.S. policy being more balanced," said Rogulev.